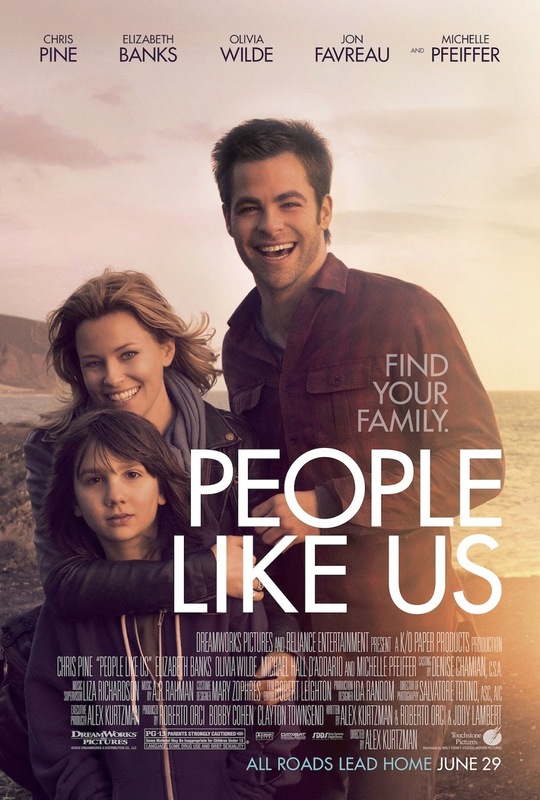 Screenwriter Alex Kurtzman (STAR TREK) makes his directorial debut with the occasionally hilarious, but tonally uneven and overlong dramedy, PEOPLE LIKE US. The person I watched the movie with judged it "the worst movie I've seen in some time". I agree that it was a wearying watch, and had more endings that LORD OF THE RINGS. But every time I gave up on this over-wrought drama, a scene would take place that once again got me into it. This flick isn't a failure - it just drowned any spark of life in melodrama. Perhaps the movie's real problem is its central conceit - damaged brother discovers he has a half-sister and a nephew after his father's death. But instead of coming clean about their family ties, he insinuates himself into their lives until the sister is in danger of falling for him. This is the classic plot contrivance that only ever happens in cheap films, and prevents the movie doing what it really wants to do - which is to portray real , authentic damaged people struggling to come to terms with an emotional crisis. The movie stars Chris Pine as Sam, a resentful son commissioned by his recently deceased father to give $150,000 to the sister he never knew he had. That sister, Frankie (Elizabeth Banks) is a recovering alcoholic with a whip-smart son called Josh (Michael Hall D'Addario). Chris Pine is the weak link in the set-up with his limited emotional range, and while Banks is the better actress, she's far too glossy to convince as a struggling single mum. In every case, they are both upstaged for comedy by Michael Hall D'Addario (the coolest screenkid ever, with the best screen entrance for a schoolboy since Malcolm McDowell in IF...), and for drama by a dishevelled and conflicted Michelle Pfeiffer (Sam's mum). Her role in the estrangement of her husband from his illegitimate daughter is beautifully written and played, and it's sad that it is resolved in such a hammy way. PEOPLE LIKE US opened earlier this year in the USA, Italy, the Philippines, Chile, Norway, Germany Denmark, the UK and Ireland. It opens this weekend in Turkey.